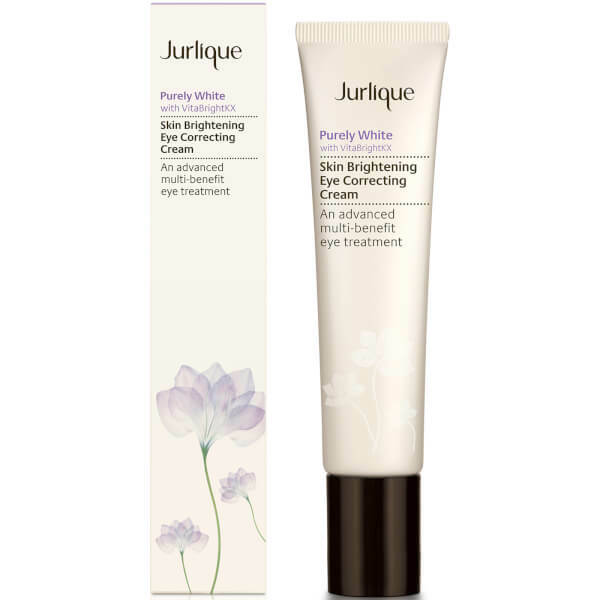 Awaken the eye area with the Jurlique Purely White Skin Brightening Eye Correcting Cream; a multi-tasking formula that works to brighten the eyes and leave them youthful. Enriched with a cocktail of brightening ingredients, the potent eye cream is able to reduce the appearance of stubborn dark circles and even patches of discolouration. Enveloping the eye area in a veil of hydration, the formula alleviates dry skin and visibly reduces fine lines and puffiness that surround the eye. Expect a refreshed appearance that is luminous and youthful. Apply a small amount to fingertips and press gently onto delicate skin around the eye area, morning and night. Aqua (Water); Simmondsia chinensis (Jojoba) Seed Oil; Citrus unshiu Peel Extract; Glycerin; Limnanthes alba (Meadowfoam) Seed Oil; Hydrogenated Jojoba Oil; Polyglyceryl-3 Methylglucose Distearate; Behenyl Alcohol; Ascorbyl Glucoside; Silica; Stearic Acid; Hydrogenated Rapeseed Oil; Cetyl Alcohol; Butyrospermum parkii (Shea) Butter; Sorbitol; Terminalia ferdinandiana Fruit Extract; Beeswax; Chamomilla recutita (Matricaria) Flower Extract; Rosa gallica Flower Extract; Glycyrrhiza glabra (Licorice) Root Extract; Viola odorata Extract; Viola tricolor Extract; Sambucus nigra Flower Extract; Medicago sativa (Alfalfa) Extract; Ascophyllum nodosum Extract; Asparagopsis Armata Extract; Hydrolyzed Lupine Protein; Anogeissus leiocarpus Bark Extract; Fragrance/Parfum*; Xanthan Gum; Tocopherol; Totarol; Mica; Titanium Dioxide; Iron Oxide; Phenoxyethanol; Ethylhexylglycerin; SD Alcohol 40-A (Alcohol Denat. ); Potassium Hydroxide; Limonene*; Linalool*; Citronellol*; Geraniol*; Eugenol*; Benzyl Benzoate*.